and young people undertaken by Ofsted and the methodology used to interpret it. Ofsted, DCFS and Ipsos MORI. 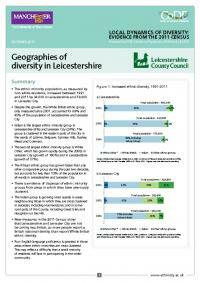 The two briefings below use data from the 1991, 2001 and 2011 Censuses to explore diversity and ethnic and religious mixing in Leicester and Leicestershire. 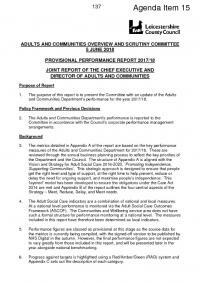 Leicestershire County Council - Adults & Communities Performance Report Q1 2017-18. Leicestershire County Council - Adults & Communities Performance Dashboards Q1 2017/18. 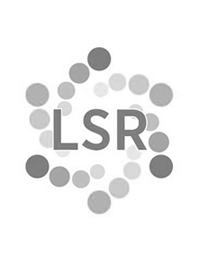 This report identifies, maps and analyses the provision of core and additional services, as defined by East Midlands Development Agency (Emda) for their Access Centre programme, in the City of Leicester. 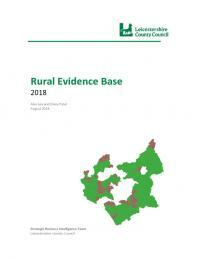 This report has been prepared by the BE Group, on behalf of the Leicester Shire Economic Partnership (LSEP) and Leicestershire County Council. The Active People Survey, a survey of adults (16 years and over) participation in sport and active recreation in England, started in October 2005, and will finish (with c.356,000 completed interviews) in October 2006. The survey is being carried out by Ipsos MORI, on behalf of Sport England. 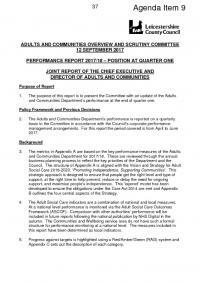 Leicestershire County Council - Adult Social Care Outcomes Framework Performance Report 2013/14. Leicestershire County Council - Adults & Communities Dashboard Quarter 4 2015/16 - Appendix 1&3. Leicestershire County Council - Adults & Communities Performance Report 2015/16. 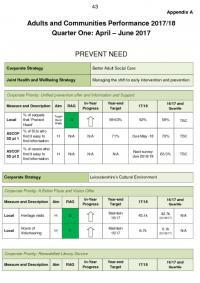 Leicestershire County Council - Adults & Communities - Integrating Health and Social Care - Better Care Fund Performance Dashboard Quarter 2 2014/15. 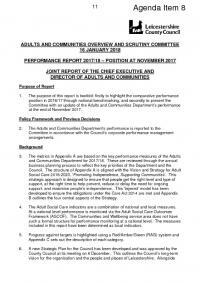 Leicestershire County Council - Adults & Communities Perfomance Dashboards Quarter 1 2016/17 - Appendix A, B & C.
Leicestershire County Council - Adults & Communities Performance Dashboard Quarter 1 2015/16 - Appendix 1 & 2. Leicestershire County Council - Adults & Communities Performance Dashboard Quarter 1 2015/16 - Appendix 3. Leicestershire County Council - Adults & Communities Performance Dashboard Quarter 2 2015/16 Appendix 1 & 2. Leicestershire County Council - Adults & Communities Performance Report Q1 2018/19. Leicestershire County Council - Adults & Communities Performance Report Q2 2017/18. Leicestershire County Council - Adults & Communities Performance Report Q4 2017/18. Leicestershire County Council - Adults & Communities Performance Report Quarter 1 2016/17. Leicestershire County Council - Adults & Communities Performance Report Q2 2014/15. 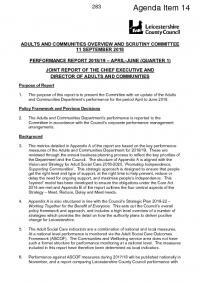 Leicester County Council - Adults & Communities Performance Report Q3 214/15. Leicestershire County Council - Adults & Communities Performance Report Quarter 4 2015/16. Leicestershire County Council - Adults & Communities - Integrating Health and Social Care - Better Care fund Performance Dashboard Quarter 3 2014/15. Leicestershire County Council - Adults and Communities Dashboard Quarter 4 2015/16 - Appendix 2. 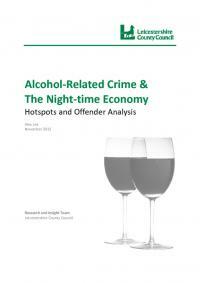 A statistical profile of alcohol related harm across Leicester, Leicestershire & Rutland is now available.